Has Your Home Suffered Shingle Damage? Contact Airborne Roofing For Help. During the lifespan of a house, the occurrence of storms, debris, aging, and other issues that affect the exterior are to be expected. But damage to siding can easily be repaired. Holes, dents, rot, and soft spots are just some problems you face with siding – but with proper repairs, you don’t have to worry about needing siding stripped and fully replaced. 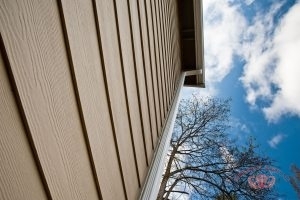 Have you seen any damage to your home siding? Did your house take a hit after a recent storm and you are looking at siding repair? Contact us (856) 662-1382 to schedule your siding repair service in Berlin and Cherry Hill, NJ. There are several siding options available to choose from, and each are serviced and repaired differently. Just a few of the siding repairs that are commonly asked for are vinyl, wood, cement or shingle sidings. All of these siding materials run the risk of buckling, warping, or being removed completely if there is no proper care and maintenance performed routinely. Siding repair services from Airborne Roofing ensures the siding on your home is weather resistant, water-tight, and meets your expectations for years to come. For The Best In Siding Repair, Contact Airborne Roofing Today. During a roof repair or regular service check from Airborne Roofing, our experts may recommend a siding repair if we see damaged areas, such as chipping or dents in the siding, that you may not have noticed. 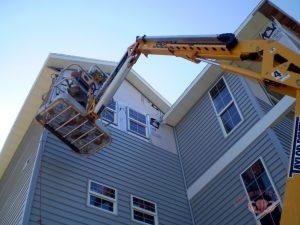 We will assess and determine the appropriate means to get your siding back to being fully functional, with little-to-no time wasted on your end. Your siding is a big part of the foundation and safety of your space, do not let a few dents turn into a bigger issue. Does Your Siding Need Repair? We Can Help! When was the last time you had your siding checked? Contact (856) 662-1382 , the always affordable and fully insured experts for your siding repair in Berlin and Cherry Hill, NJ today. We’ve been serving all of South Jersey since 1968!